Well, we are starting to become IVF experts… not that we wanted to become IVF experts but here we are. I hope, through my writing, that people have gained more understanding of IVF and how hard, intense and complicated it is. Yes, some people are very ‘lucky’ and are successful with IVF the first time they try. But sometimes it takes years of trying and thousands of dollars and sometimes IVF is not successful at all – it isn’t a guaranteed result. The process is mentally, emotionally and physically draining. Perhaps most people aren’t really aware of IVF and what it involves until they are faced with that choice. Hopefully, as you are becoming exposed to this IVF world, that for some reason is not often talked about, it makes you give anyone you know who is undertaking IVF a big cuddle and an understanding ear. With that said, here we are in Round Three, so let’s see what you’ve got in store for us. On the 1st March 2018 we started taking the Synarel spray again. This is a hormone spray that suppresses my own hormones. It allows Dr Gee to fully control me... well, at least, control my cycles. The same as last time, the spray delayed my period which delays the start of the cycle. It was a pain but this time we were prepared for the delay. Finally, on the 14th of March, my period started. I rang the nurses and happily announced “my period started today”. I never thought that I would be calling a stranger to freely share that information. The nurses called Dr Gee who advised that I was to start taking my stimulation injections on the 16th of March. The injection we used this cycle was 150iu of Pergoveris. 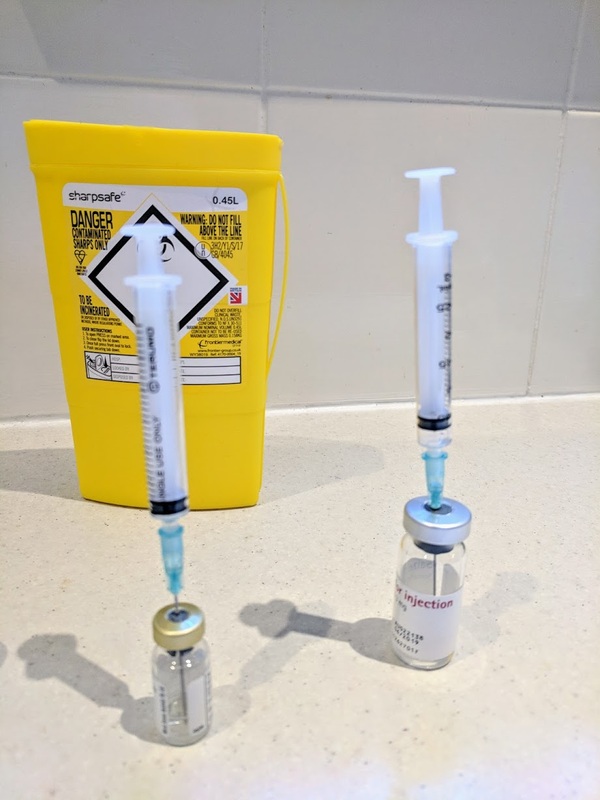 Pergoveris has to be mixed before it is injected, so, Jonny and I have learnt the skills of mixing powder with saline solution then priming the needle, just like a professional. In the first two rounds I had to get used to actually piercing my own skin with a needle and injecting a fluid into myself. I got over my initial hesitation pretty quickly and developed no qualms about injecting myself but let me tell you Pergoveris HURTS! I don’t know if it is the viscosity of the fluid but it stung so SO much going in… oh well, I guess it is the least of my concerns. On the 21st March, we had our first blood test and scan. This scan showed I had nine follicles which might contain viable eggs. We walked out of that appointment feeling neither happy nor sad. Nine is still ok but every other time we had shown eleven large follicles at this stage. But then, your head starts to question things – maybe nine is good if they are all good quality and they are all mature? From there we had another scan and blood test on the 23rd and the 24th of March. Both scans and tests showed the follicles were progressing nicely. On the 24th, the follicles all measured between 16mm and 22mm so I was told to take a trigger of 7500iu Pregnyl at midnight on the 26th of March. As with each time before this, Jonny and I sat in Mackenzie’s room looking at photographs of her. We kissed each other good luck as we did the trigger injection. We visualised her siblings, hoping they will have similar qualities to Kenzie. At 11:30am on the 28th March, exactly 35.5 hours later, we arrived at the Genea clinic on Kent Street in Sydney. Nervously we once again sat in the reception area. It was all becoming so familiar. By 12:00pm, we had spoken to our anaesthetist, the embryologist and Dr Gee. With my cannula in I was wheeled into the operating room. As I was getting settled on the bed, with my legs in the stirrups and vajayjay on display to the room, we spoke about the progress of Mackenzie’s Mission and how Dr Gee had seen an increase in the number of couples asking for the genetic testing. We felt elated to hear this from her. Once I got ‘comfortable’ they placed an oxygen mask over my mouth and nose and the anaesthetist began pushing the sleepy time juice into my canula. Each time without fail Jonny makes a joke to the anaesthetist about taking home some of his ‘medicine’ to help him manage me. Haha, Jonny, haha. You are so hilarious. We always take a photo of Mackenzie in with us so the last thing I see is Mackenzie’s face. Then I am asleep. Dr Gee inserts a vaginal probe which has a needle within it. The ultrasound probe is used to guide Dr Gee to each follicle. The follicle is then drained through the needle. As it is being drained any egg within the follicle detaches from the follicle wall and is sucked out of the ovary into a test tube. Dr Gee fills up each test tube and hands it to the embryologist who is standing behind her. The embryologist looks through the fluid to identify and separate out each egg and then places them in special fluid in petri dishes. All up the procedure takes about thirty minutes, but you are usually in the clinic for around 2-3 hours all up. I then wake up in the recovery area. When I wake up no one is there because Jonny is usually off doing his part by producing a sample. When he gets back I always ask him quickly how many eggs we got. This time we got 10! I was happy with this number, yes, we could get more, some people get over 20 eggs but, given they told me I had nine follicles, I am happy with 10, as they found an extra little egg. After I have woken up the staff continue to monitor my blood pressure and heart rate. They give me raisin toast, a coffee and some Panadeine forte with water. The Genea staff are always so lovely to us. When I am feeling better I slowly dress myself with Jonny’s help and we leave Genea to go and spend the day on the couch. This round, from memory, Jonny took me home, popped me on the couch and ordered Burger Project for us – delicious. We also tend to have the next day off, firstly because I am still usually quite sore and bloated so Jonny stays home to look after me but also on the first day we are often called around 10am to tell us how many eggs were mature and how many fertilised. We dread these calls (a mixture of fear and hope). This time my stomach was in my throat as I waited and then answered my phone. Of the 10 eggs, eight were mature and six were able to be fertilised. We were ok with these numbers, it was not too different to what we have had before. On Saturday the 31st we received the day three call. We were told that four embryos were doing very well. The other two were still dividing and looking good but were slightly behind. We felt optimistic, six were still in play. On Monday the 2nd of April, the day five update told us that all 6 were still in the running! We were so excited, we had never had this many on day five before. The embryologist said that three of the embryos were beginning to hatch but needed a few more hours to develop cells, that were not embryo cells, which could be tested. But we had three!! And the other three still looked ok, they were apparently early blastocyst stage. Maybe would we get more than three. Over this time, it was Easter. I took photographs for Instagram of chocolate Easter eggs to symbolise our eggs. Whilst I felt it was a cute way to symbolise the eggs, I also realised that we couldn’t then eat the Easter eggs. Surely that would be bad luck… I seem to have become very superstitious when on IVF, so I kept the eggs in a bowl and they became a sort of good luck shrine. Weird, I know, but when undergoing IVF, it seems that luck and rituals creep in. Every night in my good night to Mackenzie routine I would take a second to give each egg love and luck. The embryologist asked me the usual identify questions and then said “well I have some good news, you have two embryos that got to testing”. That hit me like a truck. Only two. Yes we should be thankful to have any, but in our heads we thought we already had three for sure. We asked the embryologist what happened. Apparently, the third embryo had started to hatch and show cells but had then run out of energy and began disintegrating… The other three had made it to blastocysts but were not showing any signs of hatching so they would never be able to be tested. We felt absolutely devastated. 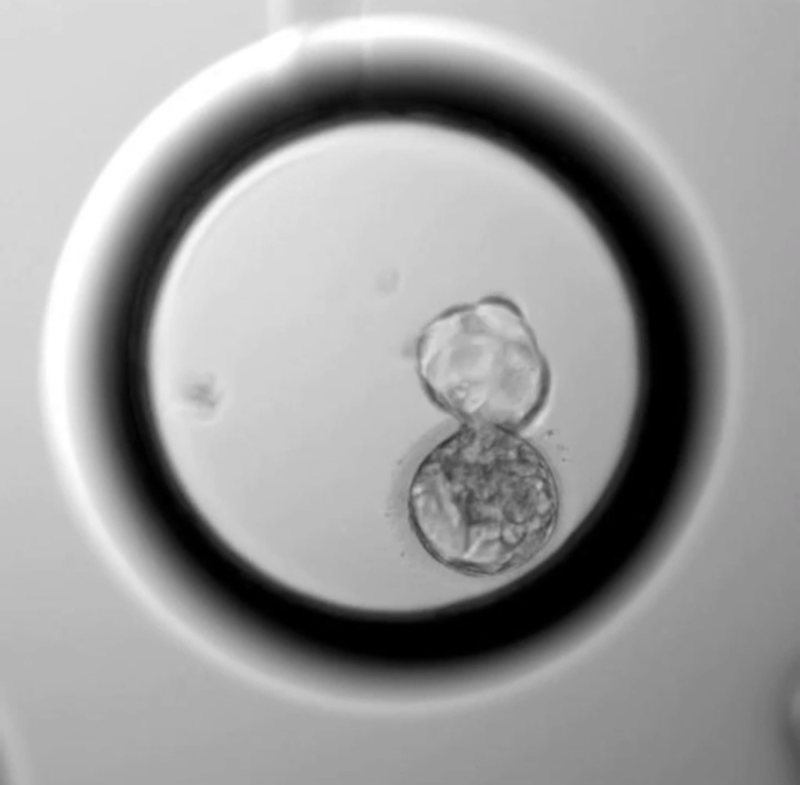 We had now officially made around 20 embryos that for a ‘normal’ couple might have made a potentially healthy baby. But for us, because the embryos needed to be strong enough to be tested, we now had only a total of four embryos that could be tested. Two from round two and now two from round three. I crashed emotionally. After finishing the call, I burst into tears on the side of the road. The whole way home I was close to wailing. Jonny walked beside me, lovingly holding me, doing his best to comfort me. Once we got home, I curled into a ball on the couch. Jonny got me a Valium, a hot water bottle and covered me with a blanket. I cried uncontrollably, oh boy, did I cry. I cried for Mackenzie, I cried for the babies that I would now never meet and never know if they were healthy and could have been in my arms, I cried for the time added without a baby in our lives, I cried that it would be longer before I could hold Mackenzie’s sibling. I was devastated. Jonny was too but he holds more hope in his heart, he remains more even and stable than I do. Partly because he doesn’t have the hormones coursing through his body, I guess, but mostly because of his upbeat personality. The next few days we dragged ourselves around in our lives, knowing we had a two week wait ahead of us until we got the test results for our two remaining embryos. Jonny sits back and tries not to think about the test results. Whereas I Google. I Google statistics and people’s experiences who have been through a similar thing. However, it doesn’t actually help because every case is different. But I knew that there was a 25% chance of the embryos having SMA and there also a 25% chance of the embryos having a chromosomal issue based on my age. Finally, the two weeks was up. One afternoon I received the call. I was at work in the middle of a 12-hour shift by myself with no one else around who could take over from me. Jonny was also at work on the first shift in his new team, about two hours in. When I answered the phone, I could tell it wasn’t good news. They told me that, sadly, both embryos were not healthy. One had SMA and one had a chromosome disorder. I felt numb. I thanked the embryologist and hung up. On automatic pilot I called Jonny and told him. I felt sorry for him, standing in uniform in a crowd, taking that call. Jonny asked if I was ok and if I needed him to come and get me. I said I was ok, I had been expecting bad news. I got off the phone and stood staring for five minutes until I broke down in tears. I cried heavily for a few minutes until I realised I could not sit there alone for the next five hours feeling heartbroken. I called my boss who came and took over from me and then called Jonny to come and pick me up. Jonny came as fast as he could but it still took him 40 minutes to get there, so I waited in a nearby park. As I sat in a dark park openly weeping, some of the usual people who often struggle with mental health who visit these parks at night, stared and avoided me like I was the one with something wrong … I suppose I was. Jonny and I now have a process that we do when we get this type of bad news. Again, Jonny gets me on the couch with a blanket and a drink then orders pizza to make me feel better and some Messina ice-cream for himself. I spent the night crying (once again), watching Mackenzie videos and just trying to let myself feel all the emotions. The next day when I woke up, I looked like I had been beaten up, with eyes red and swollen from crying. Whilst I looked awful from the outside, I was busy trying to build myself up on the inside. I knew that I needed to re-build myself – to gather my hope and courage to begin again. We needed to dust ourselves off and keep going. What else can we do?